Get connected at our park! D.O.G.G.S. (Dog Owners of Granby Getting Social) is a community volunteer organization founded in September 2004 by a group of dog lovers who believe that a well exercised dog is a happy dog. Our mission was to establish a fenced off-leash recreation area within Salmon Brook Park for the benefit of the citizens of Granby and their canine companions. 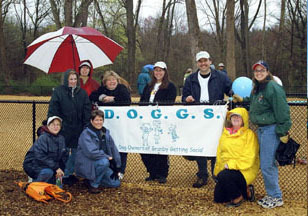 As a result of several successful fundraising events D.O.G.G.S. was able to raise the initial funding to open its doors to the public in November 2005. The park's official opening was held on a rainy day in April, 2006 and we've been open all year round ever since. The park area covers approximately 1 acre and has a water source, shaded areas, high grade playground mulch, two double-gated entrances/exits, park benches and picnic tables for the dogs to play on. Here are the original founding members in April 2006. Pictured at left:(kneeling) Laurie Wikiera, Sherry Ouellette, (standing) Gabrielle Murphy, Lisa Brown, Patt Juliano, Kelly Rome, Tom Sawyer, Alison Forsyth and (kneeling) Martha Delaney. Not pictured from original group: John Blimling and Elayne Cree. There is still a small group of volunteers who continue to manage and maintain the park thanks to private donations and our annual D.O.G.G.S. Daze of August fundraiser which is how we raise the money needed for the park budget. Volunteers clean up the park, help monitor its use, and enforce the posted park rules. D.O.G.G.S. falls under the auspices of Granby's Recreation & Leisure Services and promotes responsible pet ownership. If you or someone you know is interested in joining our group of volunteers, please contact us today at granby.ct.dogpark@gmail.com. Well-socialized dogs are better companions. They provide dog owners with a safe environment to exercise their dog and keep them in shape. An exercised dog makes a better neighbor. They are less likely to create a nuisance, bark excessively, destroy property, etc. if they get enough exercise. Promotes responsible pet ownership. All dogs are required to be licensed, healthy, and up-to-date on all of their inoculations. Provides elderly and disabled dog owners an accessible place to exercise their companions. Enables dogs to legally run off-leash (where else can they do that?!). Promotes public health and safety. Dogs help "break the ice" for shy people. People's love for their dogs often creates an important common ground, breaking down otherwise impenetrable social and economic barriers. "Whoever said you can't buy happiness forgot about little puppies!"